Delicious. The chicken, being cooked with only brandy and bacon, has an impressive depth of flavour. The gratin was also nice, and slightly lower in fat than a regular gratin, as it contains milk instead of cream. On the downside, the dish was impossible to clean up afterwards. Mmm... burnt-on milk crud. Very easy, very nice. It's basically a Thai green chicken curry. The most difficult thing about this recipe was podding the edamame (soybeans), because I couldn't find already-podded ones. It seemed like too much work at the time, but once I tasted the finished product, I felt the fabulous contrast of textures between the veggies made the process worth it. Yum yum. I had high hopes for this one, and even bought a special bottle of cabernet sauvignon vinegar (made by a collective of farmers in rural Spain, thank-you very much) for it. 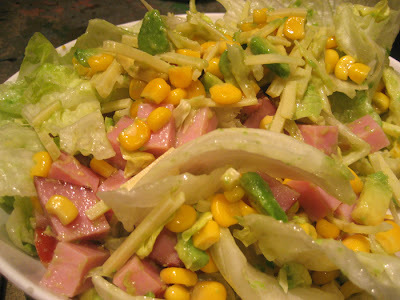 However, the combination - ham, corn, emmenthal cheese, avocado, lettuce - just didn't do it for me. I was really hoping for a salad, like Nigella's ultimate Greek salad, or Jill Dupleix's panzanella, that you just want to wolf down. Better luck next time. The worst part of using stumble upon before lunch is finding blogs like yours, I am now really hungry!